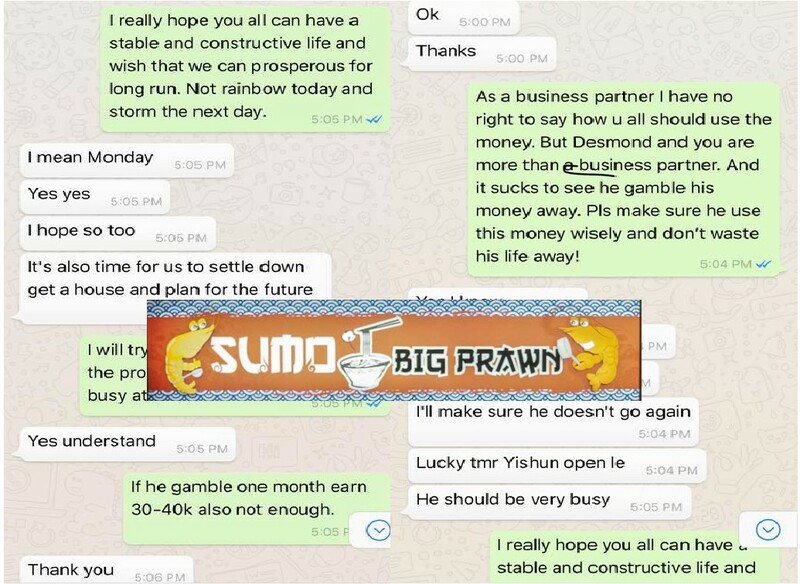 OWNER OF PRAWN NOODLE GAMBLE TILL SHOP CLOSE. You are at:Home»Caught In The Act»OWNER OF PRAWN NOODLE GAMBLE TILL SHOP CLOSE. If anyone consider of investing or buying equity please think twice. Recently I have agreed to buy 49% of shares of Sumo big Prawn. I have paid up $43,800 till date. And also assisted to expand into another outlet at Yishun 744. This June I’m suppose to clear up the remaining $55,000. During this May, Desmond who is the sole person who knows the recipe to prepare ingredient for soup didn’t not turn up to prepare ingredient for 3 days. Resulting in lose of income $1,500 per day. I deem such partnership is unfavourable with good interest. I, therefore told them that I would forfeit my shares(on the condition they take up the company as whole, profit and debt) and resign as director. They ceased Sumo Big Prawn operations on 1 Jun 2018. For YISHUN 744 the contract is till Oct 2018. By ceasing operation now results in 33K lost, excluding debts to supplier. Regina now, shred all responsibility and refuse to settle and outstanding, only agreeing to let the company declare bankrupt. On the article, they mentioned they have gave me $60,000 in dividend, which I’m not aware of. I have operated sumo amk 628 outlet since Dec – Mar. Merely 4 months, if my 49% share profit is $60,000. Just in 4 months the net profit is $120,000 ? I wonder how much is the revenue. I gladly invite IRAS, or any auditor to audit our accounts. The agreement was that to only pay first payment of $43,800 after legal document been signed. From the Whatsapp message, the only reason I gave them the money first it’s because they told me they ran into gambling debt. Now, Desmond and Regina has cut me off my shares from amk 628 and let me bear Yishun 744 alone. They said the accounts has been rigged, I invited them to open up the books to any auditor. Even if I didn’t paid up the full amount. I do still own equity of the amount payment. Which comes down to 22%.